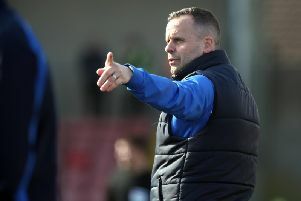 Coleraine manager Oran Kearney welcomes new signing Stephen Dooley back to the club. Coleraine have pulled off a major transfer coup by bringing winger Stephen Dooley back to the club for a third spell. The 26-year-old, who recently won the League and Cup double with Cork City in the League of Ireland, has joined on a six-month contract with the option of a further year. We have kept close contact the last three or four years and came very close this time last year to signing him. He has trained with us regularly over that period so he knows a lot of the players. Dooley rose to prominence with the Bannsiders when he scored in the 2008 Irish Cup semi final against Donegal Celtic. Oran Kearney brought him back to The Showgrounds in 2014 in a short term deal in between his studies in America and he scored two goals in as many games. The Bannsiders boss is now thrilled to bring the talented wide man to the club on a more permanent deal as they push for honours this season. “I am ecstatic that Stephen has agreed a move to Coleraine,” Kearney told the club’s website. “We have kept close contact the last three or four years and came very close this time last year to signing him. He has trained with us regularly over that period so he knows a lot of the players. “Stephen is the perfect fit of what we are looking for at the minute, he is local and has always supported Coleraine. “He wouldn’t play for any other Irish League club and we will look forward to him being available in January.